Fixed bug causing the VE.Bus firmware version not to show on the VRM Portal. Fixed bug in the MicroSD/USB eject button. Fixed bug in the Lynx Shunt Clear history button. Fixed bug in the Fronius Port number edit-box. (new) the password entry box, which is shown when changing access level from user to user/installer or back, doesn’t render properly. The functionality still works though. (new) Hub-4: The calculations behind the solar yield and consumption tab, for hub-4 systems, don’t work 100% yet. Support of recovery from USB sticks does not work on all sticks. Finding a USB-GPS might take a while. 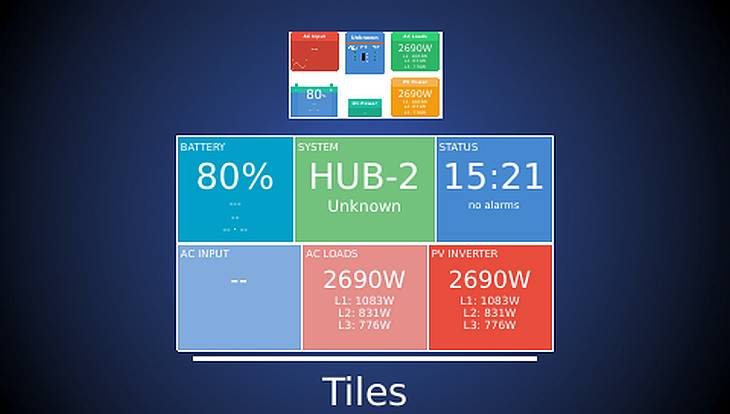 The Tiles page will show ‘HUB-1’ in case there is an MPPT in the system, even when there is no HUB-1 assistant loaded into the Multi: confusing. After starting VE Power Setup it will check online for updates and if there is a new version available it will update automatically. To manually install the new version, see the software section on our downloads page. Fixed Windows XP compatibility issues (See also this new page). VE.Can: Fix crash when querying non Victron devices. VE.Can: Fix unnecessary error message that appeared after updating a device without migration settings. Fixes in detection of expiration of messages related to remote operations, fixing spurious ‘Color Control didn’t respond to command’ errors. Requires Color Control Firmware 1.30, which is coming soon.